Chuuk Lagoon, known up to 1990 as Truk Lagoon, is a sheltered body of water in the Cen­tral Paci­fic north of New Guinea. 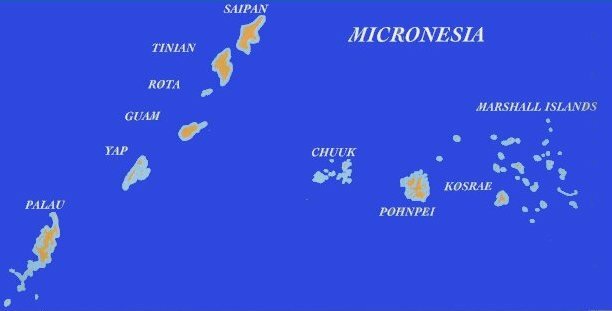 Con­sisting of eleven major islands, Chuuk is part of the larger Caro­line Islands group. Truk was part of the Spanish East Indies until the Spanish-Amer­i­can War (1898), after which con­trol shifted to Ger­many. Following Ger­many’s defeat in World War I, Truk became a pos­ses­sion of the Japa­nese Em­pire under a League of Nations man­date. Between the war years the Japa­nese made Truk their prin­ci­pal supply and repair base in the Cen­tral Paci­fic, a sort of “Japa­nese Pearl Harbor,” stationing close to 28,000 naval per­son­nel and 18,000 army per­son­nel there. 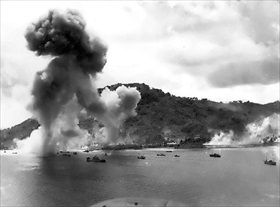 Truk was the base for Japa­nese opera­tions against Allied forces in New Gui­nea and the Solo­mon Islands. Due to its heavy for­ti­fi­ca­tions, both man-­made and natural, Truk was known to the Allies as “the Gibral­tar of the Paci­fic.” On this date in 1944 U.S. Naval Task Force 58, con­sisting of 12 carriers, 7 battle­ships, 45 other ships, and 10 sub­marines under the com­mand of Vice Adm. Marc “Pete” Mitscher, began a two-day pounding of Truk. Opera­tion Hail­stone destroyed most of the Japa­nese air­strips, 270 air­craft (56 in air combat), the torpe­do boat station, sub­marine repair shops, a com­muni­ca­tions center, a radar station, 3 cru­isers, 4 de­stroyers, 17 trans­ports, 4 fleet tankers, and 32 mer­chant ships, making Truk la­goon the biggest grave­yard of ships in the world. The Japa­nese Navy saved its larger war­ships from de­struc­tion by moving them the week before to their base at Palau at the ex­treme west­ern end of the Caro­line Is­lands. Owing to the damage and the in­ability of the Japa­nese to con­tinue using Truk as a for­ward base in the Cen­tral Pacific, the Allies were able to by­pass the is­land and iso­late it, prac­ti­cally starving its gar­ri­son along with the Trukese. The attacks on Truk and later Palau during Febru­ary and March 1944 had a crucial effect on the war: about a third of all the tankers assigned to the Japa­nese Com­bined Fleet were sunk, which was to im­pair future fleet opera­tions of the ship-poor Im­perial Navy during the cli­matic cam­paign of the Pacific War, Operation Forager—the Mariana and Palau Islands campaign (June–November 1944). 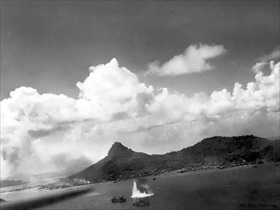 Above: Truk (known today as Chuuk) was the key logistical and operational hub supporting Japan’s perimeter defenses in the central and south Pacific. It lay between 625 and 675 miles to the east of the Mariana Islands (Sai­pan, Tinian, and Guam), which the U.S. wrestled from Japanese control in mid-1944 and where the U.S. built bases for their B‑29 Super­fortress long-range bombers that assaulted Japan’s major population and manufacturing centers in 1945. Right: Navy Douglas SBD-5 Dauntless dive bombers from a USS Lexington bombing squadron fly low over Japanese installations on Param Island, Truk Atoll. Note the smoke rising from damaged buildings. 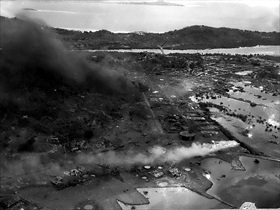 Left: Aerial photo showing the destruction resulting from the surprise U.S. raid on Truk. 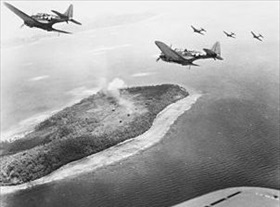 In addi­tion to U.S. Navy carrier strikes, land-based Army Air Force B‑24 and B‑29 bombers carried out their own extensive bombing campaign on Truk Atoll. Right: A Japanese freighter in Truk Atoll is hit by a torpedo dropped from a VT‑10 Avenger, Febru­ary 17, 1944. Including the ground-breaking night attack of Febru­ary 16–17, tor­pedo bombers from the USS Enter­prise accounted for one third of the total shipping destroyed by Task Force 58’s attack on Truk Atoll. 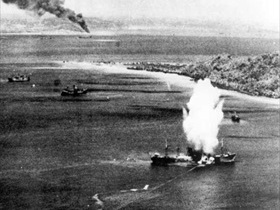 Left: Japanese ships being bombed during Operation Hailstone. The sur­prise raid managed to sink a great num­ber of auxiliary vessels and warships in the Truk lagoon. 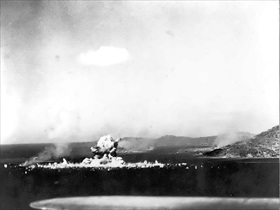 Right: Japanese ammunition ships in the Truk lagoon explode following a dive-bombing attack by a U.S. carrier-based plane, Febru­ary 17, 1944. The aircrew that dropped the bomb went missing and was believed to have been caught in the terrific explosion.